This photo supplied by the Highland County Historical Society shows the Scott House in Hillsboro around the turn of the century. Editor’s note: This story about Hillsboro’s historic Scott House was written by John Kellis from research information compiled by himself and Jean Wallis, both members of the Highland County Historical Society. For some 174 years the lovely, old brick house has watched over Hillsboro. Its stately lines have seen an ample number of good days while managing to survive its share of bad days. It has stood for years behind a majestic wrought iron fence that still stands today. The three-story brick home was completed circa 1844 by Hillsboro attorney William Scott. The architect of the Federal and Georgian home, as speculated by many, was Christopher Arthur, well-known as the architect of the Highland County Courthouse. The structure’s history is as interesting for its architectural elements as for the many uses over its 175-year journey. The mansion features an elegant widow’s walk surrounded by a wooden railing measuring 30 feet on each side. That portion of the roof features a cupola that provides access to the roof. The home for years was situated among a stately grove of trees that sat behind the gates and wrought iron fence along West Main Street. It was built in what was known as “Log Cabin Country,” even as it now looks out over the downtown areas of Hillsboro. One of the largest sweet gum trees around still stands at the West entrance of the property along West Main Street. The journey for the Scott House Mansion began in St. Peterborough, Vt. where William Scott was born on April 20, 1810. The son of David Scott emigrated to Ohio at the age of 3 with his parents to the Columbus area (Franklinton) in 1813. After the death of his mother and father, William graduated from Ohio University. Following in his father’s vocation, he was admitted to the bar in 1831. Later that year he moved to Hillsboro to begin his law practice, where his only rival was John Winston Price. Price became the common pleas judge from 1834-1841, and Scott was elected prosecuting attorney in 1837. In 1843, William Scott married Elizabeth Jane Parsons of Columbus. Scott relocated his bride to Hillsboro, where they began construction of the brick mansion located at 338 W. Main St. There, William and Elizabeth lived and reared their two children, Samuel Scott and Jane Scott, until their deaths – William in 1886 and Elizabeth in 1908. 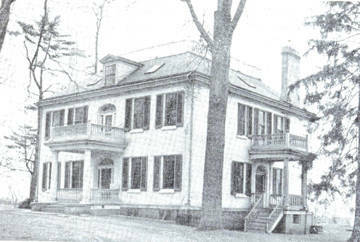 During their lives, the Scotts were leaders in Hillsboro’s social circles and the mansion presented a fitting background for the parties and social functions in which the couple participated. A young boy once shared his memories of joining his father in delivering chickens to the Scott House, and said that Mrs. Scott wanted the chickens to weigh no more than 1.5 pounds. He also remembered Mrs. Scott inviting them into the house to warm by the fireplace when it was particularly cold, and conversed with them. The boy visited the stables to see the spirited horses. The young boy was Albert “Bert” Wallis, father-in-law to local historian Jean Wallis. He also enjoyed the Carriage House and its four vehicles, one being an elaborate coach. The Scott House has often been reputed to have been a part of the Underground Railroad. Though there is no documented proof, it is a known fact that William Scott was a devout Abolitionist. No tunnel between the two Scott homes on West Main have ever been located. William Scott continued his profession for more than a half century, and through careful habits and strict business principles he amassed a fortune unparalleled by any in Highland County at the time. Scott held an interest in the Citizens National Bank and served as its vice-president. During the Civil War, Scott was appointed the provost marshall, but soon resigned due to declining health. After the war, the state of Ohio organized the Ohio National Guard and Highland County organized an infantry and a cavalry regiment in support of the guard. The Calvary regiment was named the Scott Dragoons in honor of William Scott, who contributed generously to the regiment. On Thursday night, Jan. 7, 1886, William Scott passed away at his home following a long illness. Scott was laid to rest in Greenwood Cemetery and was honored by the bar association and the local banks, who closed their doors for his funeral. Samuel Parsons Scott, having been born in 1846 at the mansion, attended school in Hillsborough and graduated from Miami University in 1866 – the youngest member of his graduating class and its valedictorian. He earned his master’s degree in 1887 and began his law practice in Leavenworth, Kan., and later in San Francisco, Calif. till 1875. In 1895, Samuel married Elizabeth Woodbridge, whose grandfather, John Woodbridg,e owned the Rapid Forge, located along Paint Creek in western Ross County. Samuel and Elizabeth began their marriage in a home built by the Scotts across the street from the mansion where the Veterinary Hospital now stands. After his mother died in 1908, the couple moved into the mansion. Samuel traveled in Europe extensively and authored two books on Spain and the Moorish Empire. He was well versed in Spanish law, a life member of the Royal Meteorological Society in England, and maintained one of the most extensive private libraries of the day that covered an entire floor of his office building. The brilliant, but according to some, eccentric gentleman drove an electric car and was often referred to as overbearing. The Scott estate was appraised at $1,139,867.56, and after contesting the will, Mrs. Scott received 55 percent of the entire estate, with the remaining amount going to the college. An endowed fund was created by the college and the on-campus Scott library and administration building were named for Samuel Parsons Scott. Mrs. Scott, having no children, lived her remaining life in Hillsboro in the mansion, maintaining a chauffeured limousine and spending the winters in a hotel in Columbus. She passed away in 1946 and was buried beside her husband in the Hillsboro Cemetery. In a story passed along by Lowell Chaney, longtime Hillsboro electrician, the mansion was bought at auction by Larkin Chaney and Carey Mount with the intent of turning the property into a car showroom and sales lot. Lowell said the Hillsboro Board of Education was making plans to expand onto the grounds surrounding the new high school that had been built in 1936 and razed in 2008. The school and facilities were all built upon portions of the Scott family property. The school board convinced the two businessmen to sell their interest in the three-acre Scott parcel that includes the mansion and the current parking lot on the corner of West Main and Elm streets. On Oct. 10, 1946, a deed of record was transferred by Mount and Chaney to the Hillsboro Board of Education. That land purchase eventually became Richards Memorial Field and the grounds around the former Hillsboro High School. At that time, Beech Street continued through to Willetsville Pike, apparently over top of where the football field is located today. Chaney had been given the job of refurbishing the electrical system of the Scott House by the school board. He recalled a large wooden and slatted door, still in the basement today, that he presumed to be to a wine cellar, and also a large copper laden kitchen in the basement. While working in the building, Chaney was going through some refuse in the basement where he found a bottle of wine dated 1877. The school board rented out portions of the mansion before leasing the first floor of the building to the Hillsboro Library in 1947 for $500 a year. The library fortunately had relocated to the Scott House a year or so before the Feb. 5, 1949 fire that destroyed its former location at the Hillsboro City Building. In 1970, the Highland County Library Association built a new library where it stands today on the corner of Willetsville Pike and West Main Street. This again left the mansion empty. The Scott House was leased to the Highland County Community Action Organization from 1972 to 1982. The Scott House was saved from the wrecking ball in 1992 when the school board, after considering its demolition, agreed to lease the building to the Great Oaks Career Development Center, which worked with community leaders to raise funds and renovate the structure for use by Great Oaks. Still visible in the Scott House are plaques recognizing some of the major donors to that effort: Vernon B. Fairley, Jim and Susan Gibbs, Fifth Third Bank, Liberty Savings, Weastec, David and Kay Ayres, and Merchants Bank. Many others donated to the project and/or spent their time organizing and carrying out the renovation. The story surrounding the renovations and the ultimate decision by the board of education to retain the restored building for its administration offices has been a sensitive subject. Following the restoration project, the school board declared a space emergency and kept the building. While many were hurt and disillusioned by that process, it led to an effort to save and restore the mansion. While the school retained its administrative offices in the building for another 15 years, the building was ultimately vacated by the school. That action eventually led to the acquisition of the Scott House by the Highland County Historical Society. The school district could not legally donate the building directly to the society, but through the county commissioners and then Community Action, the ownership of the building was transferred to the historical society. It was the hope that the historical society could find a way to preserve the building and develop a sustainable business plan for the Scott House. The challenge was to do so without taking away from other historical projects and activities crucial to the historical society. In 2013, the society rented two first-floor offices to the Highland County Chamber of Commerce and the Ohio Valley RC&D Council. The plan was to maintain tenants in the building, producing rent to offset the operational costs and thus preserving the building for the community. The historical society appointed a committee in 2014 to manage the building and study options for its ultimate use. That committee, together with the society’s Building and Grounds Committee, reviewed previous studies, proposals and ideas for the Scott House. The committee felt that grounds surrounding the mansion could also be used for community events like picnics, art shows, showers and reunions, and all agreed that it should stay with the building. The proposal included the needed improvements for the Scott House as part of the society’s 2015 Capital Campaign. That campaign was primarily to address needed structural work at the society’s Highland House Museum. Roughly $112,000 was needed to accomplish the identified Scott House improvements. The Campaign Committee requested funds from the Ohio Legislature to install needed improvements and to restore many elements of the structure. The project was included in the State’s Capital Improvements Budget in the spring of 2016 in the amount of $110,000. The society agreed to maintain the building ownership for a minimum of 10 years, at which time the state’s bonds would be retired. The business plan aims to maintain community-minded tenants supporting the building for years to come. Common areas can be rented for reunions, showers, meetings, and the like through the historical society. The state appropriation allowed the historical society to lease out all the office spaces in the building without depleting its investments or operational budget. That, in turn, allowed more affordable rentals for community organizations. The Chamber of Commerce and The Ohio Valley RC&D Council began renting those spaces in 2013. The board subsequently found additional tenants for the second-floor offices and the building is on pace to pay its own way for the first time in its 175-year history. The state funds were designated to repair and treat the homes’ outside wooden trim, upper landing railings and cupola, as well as the addition of new vintage office lighting. Funds also replaced the aging heating and air-conditioning units, and improved the second story for office spaces. Other items addressed were improvements to the kitchen, a new roof for the outbuilding, the addition of drainage around the foundation of the building, a new roof for the widow’s walk, rebuilding the estate’s entry gates and adding fence post caps. Improvements were also made to the third-floor spaces for future use. The society’s goal is to maintain a “community-minded” business model for the mansion so it can become a “Front Door Building” of Hillsboro alongside other buildings like the courthouse and Bell’s Opera House. https://www.timesgazette.com/wp-content/uploads/sites/33/2018/04/web1_Turn-century-Scott-pic.jpgThis photo supplied by the Highland County Historical Society shows the Scott House in Hillsboro around the turn of the century.